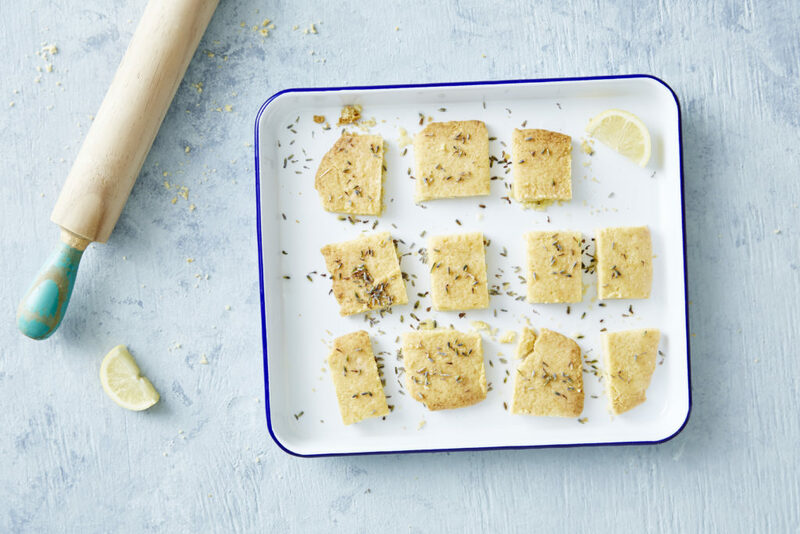 This lemon and lavender shortbread is rich and buttery – the perfect little treat when you feel like something sweet! 150 g unsalted butter, softened. 1 1/2 cup plain flour. 1/4 cup coconut butter, melted, to serve (optional). Dried lavender, for decorating (optional). 1. Preheat oven to 150°C/300°F/Gas Mark 2 and line a large tray with baking paper. 2. Using an electric mixer or stick blender, cream softened butter with stevia and vanilla extract for 2 minutes, or until very pale and fluffy. Make sure to scrap down the sides of the bowl a few times. 3. Add in lemon rind, flour, lavender essence and lemon juice and stir through with a wooden spoon to form a soft dough. Remove from the bowl and knead dough lightly with your hands for about 1 minutes. Press into a ball and place back in the bowl. Cover with a tea towel and refrigerate for 15 minutes. 4. Remove from the fridge and roll out the dough between two sheets of baking paper using a rolling pin. The dough should form a large square. 5. Dip a sharp knife in a little flour and cut dough into small squares (or desired shape). Gently transfer shapes to prepared baking tray. 6. Bake for 15–20 minutes or until firm. Allow shortbreads to cool completely on the tray before moving as shortbread is naturally very delicate. 7. Decorate biscuits with coconut butter and edible flowers, if using. Gluten-free option: Substitute plain flour with 1/2 cup gluten-free plain flour and 1/2 cup rice flour.